In 1869, the Baptist Church bought part of Town Acre 863 (part of the present site) and later that year began building the church complex. The church, hall and schoolrooms were opened in 1870, while construction of the manse did not begin until 1882. It was the church’s third manse in North Adelaide, the others being on Kermode Street and Lefevre Terrace. The manse was built at a cost of £1800 during Reverend A.W. Webb’s ministry. It is large but austere, with little decoration. The main facade is curiously two dimensional, with windows simply punched into the wall. The building is sandstone with stuccoed dressings, although unfortunately the sandstone has been painted and there are unsympathetic additions at the rear. The manse is now adapted for use as a restaurant. 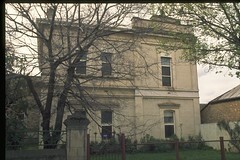 The building is of some architectural and historical significance as an early manse in North Adelaide.